The mid 90s (say, 1992-1996 or so) sound like a very interesting time for user experience. My history project has given me the opportunity to talk about this time period – a time period where I was not, let’s say, particularly concerned with UX, web design, or even the Internet, for the most part. It was during this time period that the modern web browser was invented. Whereas before you connected to servers and downloaded documents, Mosaic, this first browser did, well, pretty much what you would expect a browser to do. Except that it was the first one to do so. Suddenly you could pull up web pages full of text and pictures and follow links to other web pages. During these years, businesses started hopping on the Internet, more as a matter of prestige rather than a practical need to do any business online. Individual people became interested in building their own websites, and came to the conclusion that they could make some money doing this for other people. Some of those people that enjoyed building websites are people that I’ve been interviewing. They started web design businesses along with a whole bunch of other people – by the time you got to 1995 and 1996, there was an explosion of web design firms. Back then, the idea of user experience hadn’t penetrated as widely as it has today. Nowadays, UX is widely known as a critical component of a successful business, such that there’s supposedly a huge demand for UX professionals. Twenty years ago, it was necessary to sell potential clients on the idea of UX, as something that would make a website more successful than a pretty but unusable one, for example. It’s like UX was just one of multiple areas that a web design firm could specialize in. But maybe that’s the way it’s always been, even today. It sure sounds like everybody is on board with the idea that UX is critical to a successful website, but it’s also an all-too-easy concern to jettison the moment a project runs into trouble. This entry was posted in UX History on March 26, 2015 by admin. I think that the expansion in the user experience field followed the growth and spread of computers. This may not be news to other people, and isn’t really a big surprise to me, but until I started the history project, I didn’t think quite so explicitly about the timeline. UX’s roots go back far, but the human-computer interaction field, probably the start of usability or user experience proper, takes shape around the late 1970s and early 1980s. This field is, for the most part, filled with academics. One of the drivers of this growth is the spread of mainframes and then minicomputers away from academia and out into the business world, where suddenly these complicated machines had to be used by non-scientists. People in computing and psychology noticed suspected that these machines could be designed in a user-centered way, and thus human-computer interaction started to coalesce. The field stayed mostly academic for much of its first decade. However, going into the late 80s and early 90s, microcomputers (AKA personal computers) came on the scene in a serious way and spread computing even further into the world. There were more and more practitioners working outside of academia to make computers easier to use, and while they took what knowledge they could from the academic CHI conference and from academic papers, there was a movement to start a professional organization that catered to practitioners. Thus, UPA was born in the 90s, and, in time, other organizations related to user experience. I still struggle with a good explanation for why a group like the UXPA struggles for membership nowadays. Perhaps it’s the result of our field’s success—with so many practitioners, there are so many opportunities to learn and to network with other practitioners, that there is a necessary fragmentation of professional organizations. This entry was posted in UX History on March 19, 2015 by admin. A couple of times a week on the MacBook Pro (or Apple keyboard), I accidentally hit F4, come face to face with the incomprehensible screen full of unorganized icons, and back out quickly. As I researched this post, I learned that this feature is called Launchpad and that it has something to do with the (anticipated?) convergence of desktop and mobile operating system experiences. I guess when you combine Launchpad with the Dock is OSX, it’s kind of like the way iOS organizes apps. But, wow, when you first encounter Launchpad in an uncurated stated, it is an incomprehensible jumble. I guess it’s organized according to the order in which things were installed. 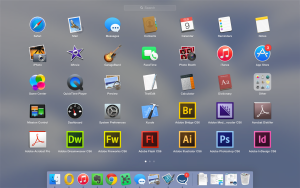 How is it useful in a world where people tuck everything they need into the dock? It’s not like the average person uses that many different applications. As part of my research, I settled down and tried to organize Launchpad, which was a nightmare of awkwardly holding down a button on my keyboard and moving icons around. Icons that didn’t want to move between the multiple screens of Launchpad. And sometimes I just had to touch the Option key once, and sometimes I had to hold it down. By the way, some icons are deletable, and most are not, which meant that I just kept shoving applications I barely use into one big folder. I suppose that means I’m using Launchpad the wrong way – after all, it’s clearly meant to be a place where you keep every single program on your computer. In the end, I used the first screen to hold icons for all the applications I actually use on a regular basis, and left everything as a jumble in the next 3 screens. It’s not like I’m going to start using Launchpad, anyway. I use Quicksilver and just type what I want (if it isn’t already open). This entry was posted in Product Design on March 12, 2015 by admin. One story I’ve heard while talking to Professor Paul Green at the University of Michigan is about the formation of ACM SIGCHI. I knew that this is a venerable organization, but I didn’t know exactly when it started. Paul spoke about his recollection of events from 35 years ago, so an article written by Lorraine Borman, one of the founders of SIGCHI, helped pin down the dates. Apparently, back in 1978, ACM SIGSOC (Social and Behavioral Computing) had a conference in the Washington, DC. According to Paul, they invited Al Chapanis as the speaker, who had the been the president of the Human Factors and Ergonomics Society (HFES) and was well known for his work in human factors and computer systems. In Borman’s article, she writes that “SIGSOC presented what may have been the first ACM panel presentation on the user interface at the ACM Conference… ‘People-oriented Systems: When and How?’” which Borman chaired. ACM SIGSOC had planned for 200 people to show up at their conference, but instead something like 600 people showed up, including many human factors folks. After this meeting, some of the folks involved in it—specifically, the University of Michigan’s Greg Marks and Lorraine Borman—thought that they were on to something. They saw a connection between the computing people and the human factors people, so a group of people from the meeting, including Paul Green, met to talk about ways to continue the collaboration. Thus, ACM SIGCHI was born, because ACM had the resources and the drive to pick up this new idea and run with it. Apparently, there is a story that HFES dropped the ball, so to speak, on bringing in the computing realm together with human factors, but it was more a matter that ACM had resources at the time and HFES did not. I had no idea that the University of Michigan played such a role in the forming of ACM SIGCHI. This entry was posted in UX History on March 5, 2015 by admin.